China plans to resume use of its largest carrier rocket, Long March 5, this year amid a tight launch schedule expected to make the country the world's biggest source of space launches for the second year in a row. The third mission of Long March 5 is scheduled to take place in the second half of July at the Wenchang Space Launch Center in Hainan province. Preparatory work is proceeding well, according to Yang Baohua, deputy general manager of China Aerospace Science and Technology Corp, the nation's top space contractor. 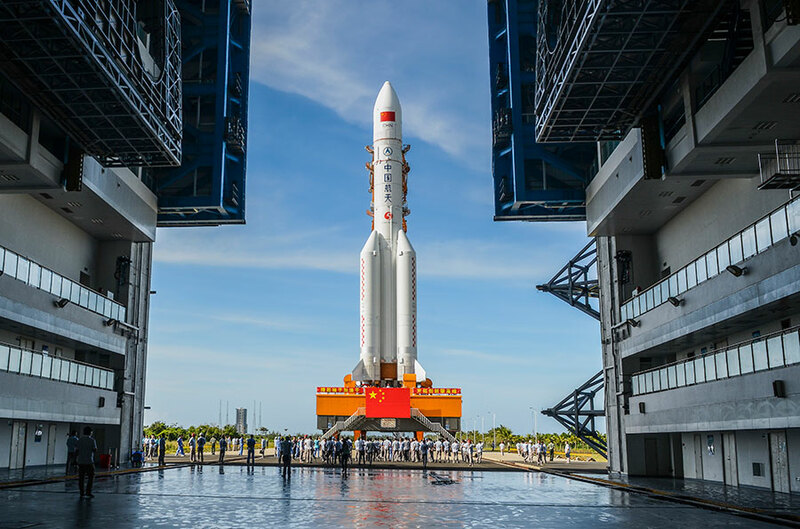 "Overall work for the resumption of Long March 5's service is going smoothly, though some improvements, especially those on the rocket engine, still need to be done," Yang said at the State-owned space conglomerate's headquarters in Beijing. "The goal of resuming its flight in July appears to be achievable." Use of the Long March 5 was temporarily suspended last year after a failure occurred during one launch. The July mission will place the SJ-20, an 8-metric ton technological demonstration satellite, into a geosynchronous orbit. The satellite is the first based on China's new-generation satellite platform, the DFH 5, and will be used to verify several key satellite technologies, he said. Yang also noted that the rocket is expected to conduct its fourth mission before the end of this year as part of the Chang'e 5 mission, the country's fifth lunar expedition. The strongest and most technologically sophisticated rocket ever built by China, Long March 5 has a liftoff weight of 869 tons, a maximum carrying capacity of 25 tons to a low-Earth orbit, or 14 tons to a geosynchronous transfer orbit. Transfer orbits are typically elliptical and are used to transfer between two circular orbits. Its payload capacity is about 2.5 times bigger than any other Chinese rocket. The gigantic rocket's first flight was in November 2016 at the Wenchang center. The second mission was in July 2017 at the same site and failed due to structural abnormalities inside the turbine exhaust device of one of the first stage's liquid oxygen/liquid hydrogen engines. The nation's space industry has pinned its hopes on the Long March 5 and its variants because scientists and engineers want to use them to assemble the first Chinese space station and to send probes to Mars and Jupiter. The July 2017 failure extensively affected the country's space agenda given that the government had to postpone several key missions such as the Chang'e 5 mission, which aims to send a rover to take samples from the moon's surface and bring them back to Earth. So the resumption of Long March 5 flights has been eagerly awaited for a long time. Another key event in the Chinese space industry this year will be the country's first sea-based launch, planned using a Long March 11 rocket in the Yellow Sea, said Jin Xin, deputy project manager of Long March 11. China Aerospace Science and Technology said in a statement that it has plans for at least 30 space launches this year, while another contractor, China Aerospace Science and Industry Corp, intends to make at least five launches of its Kuaizhou-series carrier rockets. At least two orbital launches are expected using privately built rockets. China expects to make at least 37 launches, more than those planned by any other nation. In 2018, China, for the first time, launched more rockets into orbit than any other country.